Paint Dancing is a new craze created for the purpose of openly expressing yourself for fun in 2 different mediums - AT ONCE! We supply the non-toxic paint, brushed and paper! All you need is your paint clothes (and shoes) and you are ready to PAINT DANCE! Paint Dancing is a safe, supportive and fun environment. The best news is; you don't need to know how to paint or dance to participate! See Paint Dancing on Evening Magazine! Paint Dancing was founded by internationally known abstract expressionist painter and hunger awareness activist, Matt Jones. We began with a vision to supports food banks around the world in their efforts to end the threat of hunger. We are proud of the work we have done and graciously thank everyone that has helped us grow. See tons of spuds and checks delivered to NWH! We are excited to announce that we have decided to expanded our support to include other types of organizations that are doing good in the world. We would love to hear your stories about how Paint Dancing helped your organization’s efforts to change the world! Latin, World, Rock, R&B, Ecstatic, Ballroom and Blues Dancers! 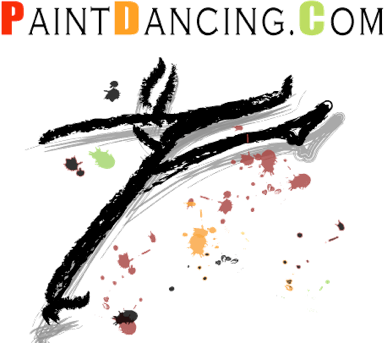 Expand your world to Paint Dancing and take home your masterpieces! Have fun and share your smile! See Paint Dancing on City Stream!